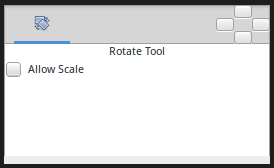 The "Rotate Tool" rotate the selected Handles. It works much like to Transform Tool except for when multiple Handles are selected. Then drag one of the selected Handles. All the selected Handles will move, rotating about the center of the selected handles group. This page was last modified on 7 March 2016, at 19:27.